Ah, AM: It is worth noting though that Hitchens, in common with MPs, has a career too! “But to have any impact, the 80 must quit the Tory Party, which last week finally and irrevocably turned its back on its voters”. Which is something I think we all can agree on. AM, I linked to this also in my last post but from his blog, where Cash and Pritchard do not appear. 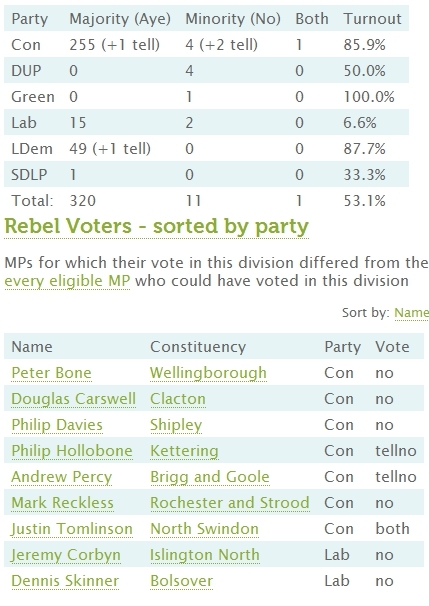 Hitchens also seems to have got his numbers wrong -81 ‘rebels’ are all about self-preservation and are worried about their seats next election. 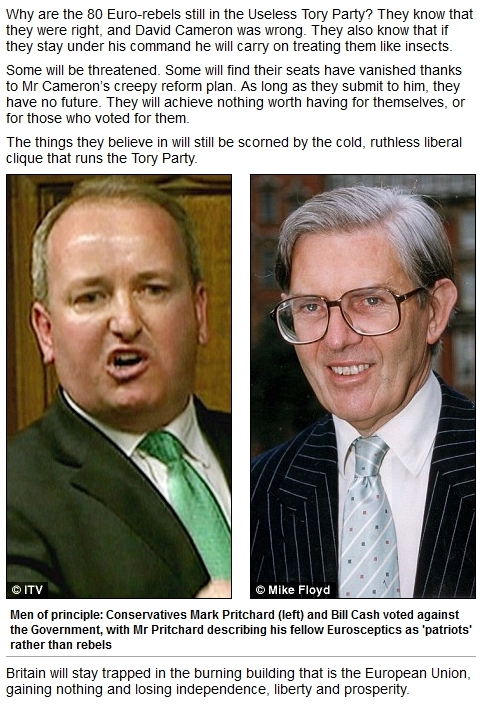 The mail must be putting something in the water simon heffer today was full of praise offering sincere tributes etc. On the ‘rebel’ numbers Pixi, I did not include the tellers, although they would have voted for the referendum making a total of 81. I meant hitchens got it wrong who said 80, which doesnt add uo its either 79 with 2 tellers or simple 81. Most Labour supporters are very anti Conservative too, but it doesn’t stop them being pro-EU or Europlastic. Hitchens is very clear in his views that the Tory Party must be destroyed. His desire to see this happen is in the hope that a truly conservative party will be born only from the destruction of the Tory Party. He is thus goading the Tory rebels to break away. I don’t see any deceit in what he’s said here. As I am not a conservative, I don’t share Hitchens’ hope of a true conservative phoenix, but I’m happy to see the Tory Party disintegrate nonetheless. It’s 77 without tellers and without the two who voted aye and no. And it would be even fewer if you stripped out all those who have no chance of preferment and realise that this government has anyway only a couple more years to run, as well as those affected by boundary changes.